SimParc (Simulation Participative de La Gestion de Parcs) is a French-Brazilian interdisciplinary research project, conducted by Pontifícia Universidade Catolica (PUC-Rio), Computer Science Department, RJ, Brazil, Universidade Federal do Rio de Janeiro (UFRJ), EICOS Program, RJ, Brazil, and Universitè Pierre et Marie Curie, Laboratoire d'Informatique de Paris 6 (LIP6), CNRS, France. 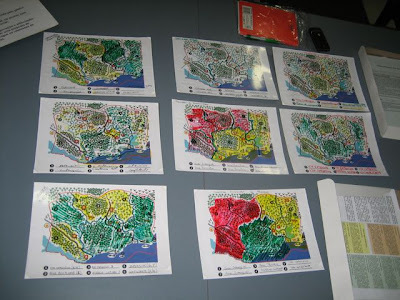 The Research Project has recently reported the experience in the design, use and evaluation of a Serious Game for national parks’ participatory management, aiming at biodiversity conservation and social inclusion. Helping the various stakeholders understand conflict dynamics undermining natural resources management and collectively agree upon strategies for conflict resolution is a major project objective. Examples of inherent conflicts biodiversity related are irregular occupation, inadequate tourism exploitation, water pollution, environmental degradation and illegal use of natural resources. The Serious Game prototype combines distributed role-playing games, support for negotiation and artificial agents. It is based on the observation of several case studies in Brazil. The project team, however, chose not to reproduce a real case study in order to leave the door open for broader game possibilities. Initially, SimParc game has an epistemic objective: helping each player to discover and understand conflict dynamics. The game considers a certain number of roles, each one representing a certain stakeholder. Depending on the profile and the elements of concern in each of the landscape units (e.g., tourism spot, endangered species…), each player has to perform the designed/selected role with its respective postures and agendas. 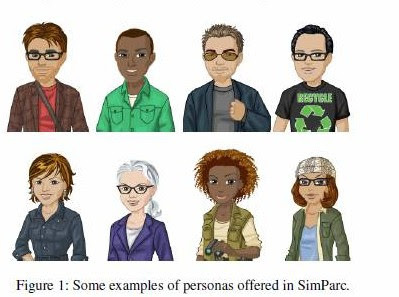 To facilitate role-playing, SimParc offers a set of personas to represent him/her during the game.